A rather puzzling translation from the original title, A Murderer’s Guide to Memorization. 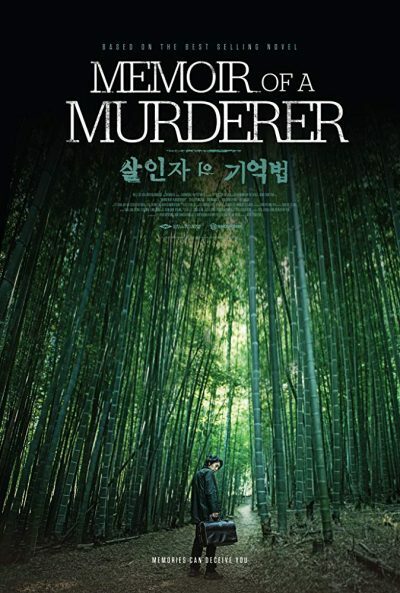 For the new Western one appears to be referencing Memories of Murder, another Korean film about a long-running serial murderer, from 2003. But it’s equally close to The Memory of a Killer, a Belgian movie which also concerned a killer with Alzheimer’s – albeit a hitman. Confusion between the three seems almost inevitable. This one concerns Byeong-soo (Sol), who used to be a vigilante type, killing those he deemed guilty of unacceptable acts – he started with his abusive father. A car accident caused a head injury which apparently stopped these urges. Years later, a copycat has started up, and Byeong-soo is worried he might be once more responsible. For he is now suffering from Alzheimer’s, causing gaps in his memory, to the point where he even attacks his own daughter, Eun-hee (Kim S-h). Are his long dormant tendencies awake again? Or is the killer Tae-joo (Kim N-g), Eun-hee’s policeman boyfriend? 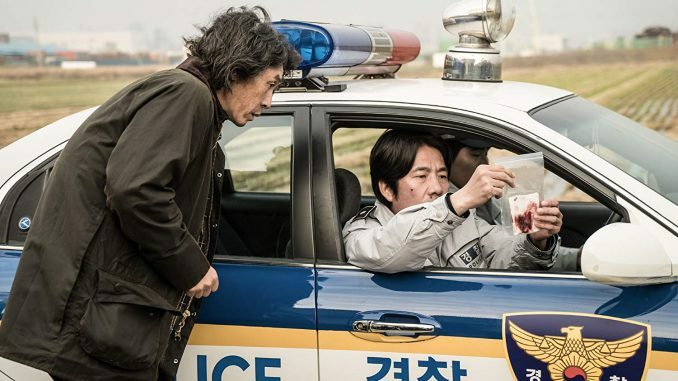 Byeong-soo first encounters him on a country road, with a mysterious, bleeding bundle in the trunk of the car… Or maybe not, because Byeong-soo can’t even trust his own recall of events and, it becomes clear, things he strongly believes to be true might not be the case at all. I’ve complained previously about the cinematic version of amnesia, but the way much the same idea is used here works well. Byeong-soo is the very archetype of the unreliable narrator, and as we experience everything from his viewpoint, it makes for an disturbing experience. I know the impact Alzheimer’s has on those it affects: they can be perfectly lucid one moment, and have no clue who, where or even when they are the next. It would be one of my worst nightmares, personally – though I imagine from the inside, it doesn’t feel like much is wrong. The spells of clarity would likely be worst, knowing they’re only temporary, and you’ll eventually slide back below the surface of dementia. There’s something of Memento here, with the hero trying to solve a crime around a mental condition which requires him to leave notes to himself, though Byeong-soo doesn’t need to go quite as far as tattooing himself. [Maybe he should, for his less permanent methods prove potentially subject to change] Won gives a fine performance; at some points, I was reminded of Takeshi Kitano, both men exhibiting a similar combination of dogged determination and world weariness. He’s prepared to go to any extreme to protect his daughter, though his actions may cause more danger than they prevent – and as we find out, their relationship is more complex than she knows and he remembers. In the end though, like another recent Korean film Forgotten, this does still remains a cheat – albeit a well-constructed and crafted one. Forgotten was marginally superior, with its high points above those here, and Memoir feels slightly over-stretched, at 128 minutes, especially given there are only two possible outcomes.